The Nikon D750 is the new full-frame digital camera, offering a stunning 24 megapixel sensor, ultra-high ISO capabilities and high frame rate for capturing fast action. It follows in the tradition of Nikon professional DSLR, borrowing technology from the flagship D4s while being affordable like its legendary predecessor, the D700. Today Nikon offers full range of DSLR: The D610 (and D600) aimed at the enthusiast and those moving up from DX. The D810 offering exceptional detail and high dynamic range. The D4s for the most demanding professionals, sports photographers and photojournalists. The D750 is perhaps the most versatile of the bunch. With its resilient weather-sealed magnesium alloy and carbon composite body, high frame rate (6.5 fps), and high-resolution 24.3MP sensor it is both capable and ready to take on any photographic task. Comparing the D750 to the D600 and D610 is a difficult task. The D610 is a unique model, bridging the gap between APS-C (DX) and full-frame (FX). 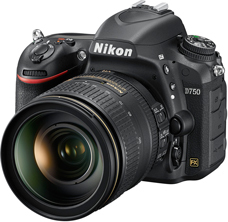 It uses proven technology from the D7000 as well as improvements from the professional level cameras. But it is a decidedly consumer camera. The body contains magnesium components (top and rear covers) but the internal frame is made of poly-carbonate material. The D750 has a combination magnesium and carbon composite (Sereebo) construction. This increases durability over the D610. The next area is in processing power. The D750 offers the latest EXPEED 4 image processing engine. It is capable of faster continuous shooting, has a larger buffer and can write to memory cards faster. For the casual user the D610 may be enough. But to the working professional who is tasked with capturing the exact moment of action, the D750 will always be ready. The D750 has the 51-point MultiCAM 3500FX AF system. This advanced processing unit allows for selection of 1, 9, 11, 21 or 51 auto focus points. The grid covers a large rectangular area across the frame, and the 15 central points are the cross type for even better focus acquisition. In addition 11 points forming a cross though the middle of the frame are capable of focusing down to f/8. In dynamic area auto focus you can select from 9, 11 or 21 points. 3D tracking allows for capturing subjects in motion in perfect focus. All points offer up to -2EV sensitivity for extreme low-light operation. The system also has group area AF that allows the user to define 5 points to isolate a subject without worry of focusing on other objects in the frame. The D610 and D600 offer a 39-point Multi-CAM 4800 auto focus system. It is shared with the DX series cameras (D7000). The focus points cover a more limited area in the center of the frame compared with the D750. Nine cross type sensors are used in the center. The middle 5 points and one point on each side are capable of focusing down to f/8. In dynamic area focus mode 9, 21, or 39 points can be selected. It also offers 3D tracking and auto-area selection, however its tracking capabilities are more limited than the D750. The D610 and D600 use a 2,016 segment RGB sensor to aid in both focus and exposure. The 750 employs a 91,000 pixel RGB metering sensor. The greater resolution offers better detection of subjects, tracking as well as more accurate scene recognition and ability to properly set exposure and preserve highlights. For the videographer, the D750 brings many advances. The D600 lacked the ability to control aperture during live view video recording. The D750 offers full aperture control, as well as smooth transitions between apertures (power aperture) while recording. The selection of frame rates is also improved in the D750. Offering full HD video at 60p is a distinct advantage and will yield smoother recording of action as well as greater slow-motion capabilities. The D750 also has a tilting LCD, something not offered on any other Nikon FX DSLR. This can make the difference when it comes to getting the right angle on shots. The D750 is truly an advanced tool for the most demanding photographer. Professionals and advanced enthusiasts will enjoy its versatility, durability and speed. It brings the most advanced technology from the flagship D4s and D810 to an affordable level for the serious photographer and videographer. Nikon D750 official announcement date is September 12, 2014. Camera to begin shipping in early October, 2014. Pre-order the Nikon D750 online for first availability. i want to purchase a camera that has the best tecknology for todays photography pictures. if you had a choice between the 600 model and the 750 model, which model is the best. Hi Don, the D750 is newer and has improved features. The main improvement is the auto focus system. The sensor performance is similar between cameras. D750 also adds a flip-out screen and it also weighs slightly less and has a deeper grip shape. I prefer the D750. I have a d600 and want to buy a d750 and a new lens. Will the lens that I already have fit into the d750 and will the new lens work in the d600? Are they interchangeable? Yes all Nikon lenses are interchangeable between the D600 and D750.